THE historical leader of the Cuban Revolution, Fidel Castro Ruz, received on June 7 Diosdado Cabello Rondón, President of the National Assembly of the Bolivarian Republic of Venezuela. During the animated and fraternal meeting, Fidel and Diosdado recalled with emotion the legacy of Comandante Hugo Chávez Frías and discussed the objectives and challenges of this new stage of the Bolivarian and Chavista Revolution, led by President Nicolás Maduro Moros. They also addressed aspects of bilateral cooperation and the world food situation. 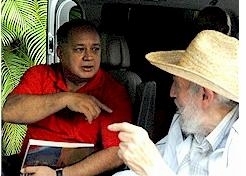 After the meeting Diosdado Cabello and Fidel briefly toured areas where high-protein crops for animal consumption are cultivated, to increase milk and beef yields. We take the opportunity to join the progressive movement and the people of the world to congratulate the Bolivarian socialist revolution, the heroic people of the socialist republic of Venezuela and our newly elected President, Cde Nicolas Maduro, for the successful national elections. The results of the elections are a living testimony that the Bolivarian socialist revolution of our America derives its existence from the foundations of our democratic principles. Reprinted from Caribbean News Now! CARACAS, Venezuela -- Venezuelan presidential candidate Henrique Capriles on Monday said he would end the country’s shipments of subsidized oil to Cuba, while at the same time referring to acting President Nicolas Maduro as a puppet of Havana. THE GOVERNMENT OF GRENADA GOVERNMENT HAS COMMENCED ITS OUTREACH TO CREDITORS ON THE RESTRUCTURING OF ITS PUBLIC DEBT ST. GEORGE’S, GRENADA, Wednesday, March 13, 2013:Since the announcement, of its intention to restructure its Public Debt, on Friday March 8, 2013, the Government of Grenada has begun its outreach to its creditors. We are pleased to announce that, following the receipt of approvals from all nine Insurance Regulators and Courts within the ECCU and The Bahamas, where BAICO is incorporated, the transfer of BAICO’s traditional insurance business to Sagicor was finalized last Friday, March 15, 2013.